Duos are all the rage these days. From Capital Kings, The Sonflowerz, Love and The Outcome and Gungor, to City Harbor, SHINEBRIGHT, and more recently Leeland; there is something special when an artist isn’t going it alone. While being in a duo can relieve much of the pressure of working on your own, while not necessarily giving as much comradery as being in a band could be; duos nevertheless have been a success within the Christian music industry. Enter in another duo- this time it is best friends Cammie Avers and Natalie Brown that make up Kaleidoscope. With their music reminding me of similar artists like Britt Nicole, Kerrie Roberts and Natalie Grant; this independently produced EP is sure to grab the attention of media executives in months to come…who knows, maybe a record deal in the future? With the duo releasing 3 of their songs last year as singles, while releasing another single earlier in 2015, and the rest together with this EP, these 7 melodies are sure to bring the dancing spirit to any listener as we hear some of the most fun-filled pop melodies of 2015 so far. While not my favourite EP of the year (Nichole Nordeman and Zealand take top spot), Kaleidoscope EP comes close. From first radio hit “Love Like You”, to their latest and last song “God In Me”, we are presented with something honest, poetic and energetic, and certain to be enjoyed if you are a fan of artists like Britt or Kerrie, or even artists like Fireflight or Superchick as well! The first single to release by the duo, “Love Like You”, in a similar theme and musical leaning to Kerrie Roberts’s song of the same name (on her latest EP My Heart’s Lifted), is as powerful as it is energetic. Released to iTunes in February 2014, both Cammie and Natalie deliver similar style vocals and a heart full of high notes, alongside looping drum percussion and a theme of loving like Jesus always no matter the circumstance or situation, to make “Love Like You” one of my favourite songs on the EP (granted there are only 7 songs). It is the bridge of the melody that makes it poignant, as both girls declare with conviction in unison that ‘…we wanna feel you move, live love in all we do, stand out and speak the truth, we wanna be the change, go on and lead the way, forever starts today…’ The last line of the bridge hits me hard personally- forever starts today. What we want to accomplish so many years down the track ought not to be pushed away until someday, but rather the dreams God has placed in our hearts for us to be passionate about ought to be started now, even if we are worried or scared. Loving like Jesus can be scary but also rewarding too. 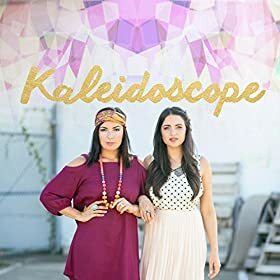 Kudos to Kaleidoscope for such a pertinent and emotive theme in “Love Like You”, a great first song to introduce listeners to the style of music that is shown through these two women of God! “Every Tomorrow”, “Move” and “Walk Beside You” are all singles released to iTunes prior to the EP release date, and each of them, though musically different, show us a similar running theme, that God is in control no matter what, and that in every situation, it needs to be certain that God is right in the middle of what we’re experiencing, otherwise we’re missing out on what He has in store for us. With a powerful piano riff, “Every Tomorrow” is an encouragement to many, as both girls deliver a daily reminder that ‘…every tomorrow you’re leading me through where you’ve already gone…’ Christ has been to every point in history (because He is outside time), and gives us reassurance that whatever we go through, will be for our good and His glory. A song that is fit for radio, with light acoustics, a very singable melody and great harmonies between Natalie and Cammie, “Every Tomorrow” leads into “Walk Beside You”, a piano prominent and acoustic guitar led song where Cammie places on her Britt Nicole hat and delivers one of her best vocal performances of the EP. As the song is an anthem for us to walk alongside our friends and family, especially those who are facing difficulties, trials and uncertainties in life; “Walk Beside You” is a testament of two-fold- that Christ walks beside us during our darkest moments, and that we can walk beside others who may need the same help given to us by God our Father. “Move”, the last of the singles released prior to Kaleidoscope EP, is a three minute rock/pop song full of heart and passion that could almost fit on an album by other artists like Mandisa, Natalie Grant or Britt Nicole. High in quality and production, we are called to move along with God, and that if He isn’t calling us to certain areas, we’re staying right where we are. The chorus places things in perspective- ‘…the world’s not gonna get the best of me, when I’m looking right at You, You’re keeping me where I’m supposed to be…if it’s not You taking hold of me, I won’t make a move…’ With these three songs, alongside “Love Like You”, anchoring the EP, Cammie and Natalie have delivered an EP certain to be enjoyed by anyone who loves CCM/pop. “Breakthrough”, “Mirror” and “God in Me” are the remaining tracks on the 7 song EP, and while these three songs aren’t necessarily as recognisable as the previously aforementioned four, Cammie and Natalie nevertheless show us what good quality indie CCM/pop sounds like, as they become, alongside The Sonflowerz, as my favourite indie duo currently. “God in Me”, track 7, is a synth layered song that speaks about how in every aspect of life, we shine Christ whether we may know it or not, that in all we undertake, it is our actions that speak to others whether God is in us or not- and hopefully the song encourages us to shine for Christ regardless of fads, fashions or opinions of the day. “Breakthrough”, a dance electronic percussion looping 3:50 melody about us breaking through normal into extraordinary and stepping into the life Christ has set before us, is perfect for track 1, and while musically is the most unique yet lyrically it is the most safe, Kaleidoscope nonetheless have presented a catchy melody full of emotion, heart and promise that the electronic genre they have explored can be refined in further recordings. Yet it is the subdued acoustically driven “Mirror” that is personally my favourite song on the EP. With just the girls voices, an acoustic guitar, and a whole lot of passion for Christ, the song is a picture of how we ought to be a reflection of Him in every minute of every day, and how as Christians, it is our joy and passion to do so. As we reflect our maker, it is out of the outpouring of love we show to others that they can hopefully ask us our source of happiness. Kaleidoscope have taken this universal theme of showing God’s love and made it uniquely theirs. Despite being the shortest song on the album, it is as powerful and poignant as the longest, (“Breakthrough” and “Walk Beside You”), maybe even more so. Well done girls for such a heartfelt song, and one that’ll be in my iTunes playlist for years to come! 7 songs and 24 minutes later, Kaleidoscope have shown us what a debut EP from one of CCM’s up and coming artists sounds like, and while they are still indie, their quality production and layered vocals are what will make this duo much sought after by record labels in the upcoming years ahead. Passionate and emotive, enthusiastic and encouraging, both Cammie and Natalie deliver an EP that is to be enjoyed by men and women, young and old, alike. As spoken by Natalie herself, and what I reckon is the theme of this EP as a whole, we are asked these pertinent questions- ‘…what would it look like if [running after Jesus]…was my constant focus and cry? Would my life look different? Would my decisions, actions, and thoughts start to change? Would I change my perspective of what is important throughout my day? Would my selfish heart begin to transform into one that is so focused on Jesus and others that no things of this world could satisfy me? …’ As I am encouraged by this duo through these songs, I am reminded of the transientness of this world, and that whatever we can accomplish, whilst still a drop in the ocean, will have a tremendous impact on those around us and in the lives of people we are in contact with daily. From “Love Like You”, and “Mirror”, to “Walk Beside You” and “Move”, there is virtually not a filler track, on their self-titled offering. Kudos to the band for EP #1. Bring on EP #2 (or album #1) whenever it arises!